I have always been a big fan of React from the very beginning, but lately I have been playing around with Vue and have to admit that I really fell in love with it for it’s simplicity. To keep things simple as possible for you, I have decided to use Vue to build our front end this time. NOTE: If you have not tried out Vue, their official documentation is the best place to start. When prompted choose “Manually select features” then, use the space bar to select Babel, Router and Vuex feature. For the rest of the questions you can just choose the defaults. Once the Vue CLI have created our project, we can change directory into it and add plugins. We are going to add the Vuetify plugin for helping us with the design. By now you will have a perfect project setup to start coding. Follow the link on your browser and you should see the default Vue template up and running! Before we start coding the front end let’s deploy our latest smart contract to the EOS blockchain. I have written a simple smart contract that has a ‘users’ table and a login method that accepts an EOS account as it’s input. The login method will store the account in the users table if no records already exist for that name. However if there is already a record, it will increment the reward_points by 1 instead. The login also ensures that only valid EOS account can enter. Let’s go ahead and deploy this contract . I have previously written a step by step guide on how to accomplish this, please click here. Add this files to your project. Your project structure should now look like bellow. Let’s start by coding the AppTopBar component. In Vue, components can be easily added to pages making it very re-usable. The AppTopBar component is simply a header bar with a title of our application. 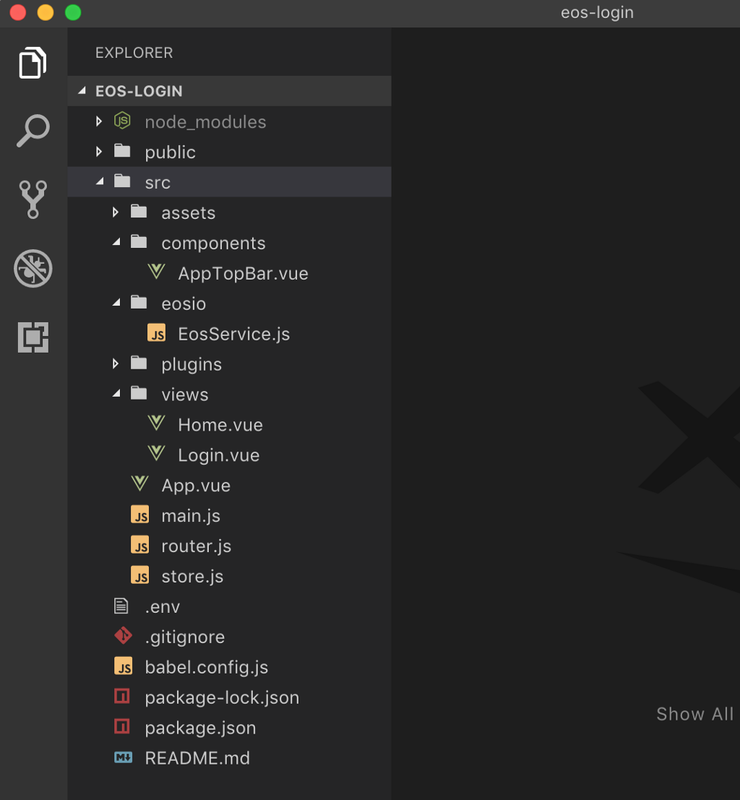 Now open App.vue under the src folder to import our component. Notice that AppTopBar has been format as inside the template. 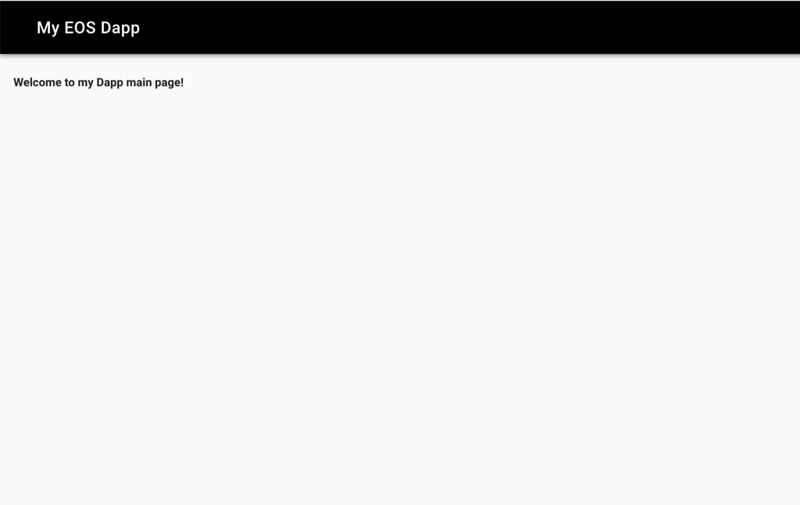 For our application we will have 2 main page which is the Login page and the Home page. On the App.vue we are using the Vue Router to link to both pages with the tag. Open the router.js file to edit the paths. Welcome to my Dapp main page! 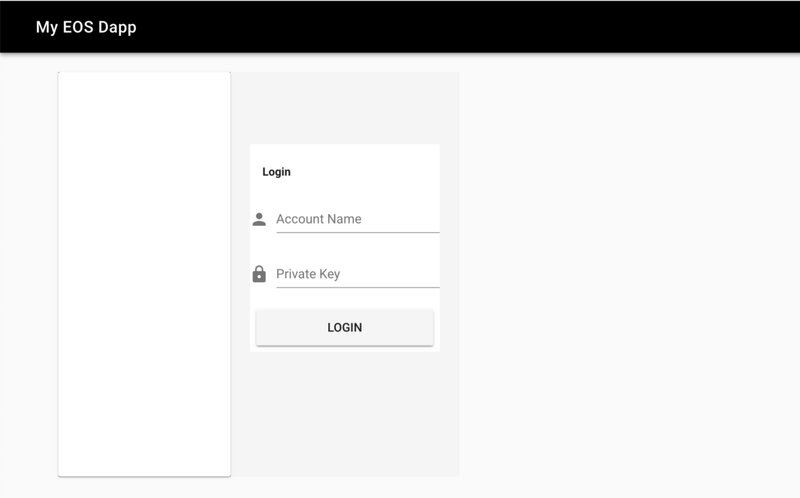 The Login.vue page calls the login function on EosService and passes the inputs for account name and private key. If the login function returns success it simply redirects to the Home.vue page. Now before I dive into the EosService login function, let’s edit our .env file with the correct values. Open the .env file under the project root directory. Set the value for VUE_APP_SMART_CONTRACT_NAME to the account name you created earlier on the Testnet to deploy the hello contract. The value for VUE_APP_NODE_ENDPOINT should be then set to a Testnet endpoint, in this case I am using the CryptoKylin Testnet. Subsequently if you have deployed your smart contract on the Mainnet then you should set the value of the endpoint to any of the 21 main block-producers. Finally let’s look into the code for the EosService.js library I created. This is where the bulk of action is happening. Basically what we are doing here is creating an API transaction by passing in the parameters of the .env file earlier. For this to work we need to create a signature provider with an EOS account private-key to access the smart contract. Since this is meant to be a simple tutorial we are directly dealing with the private-key here, however in a real world application it is best to integrate with a 3rd party wallet to handle the creation of the signature provider. That way you do not have to ask your users for their private-key directly which is insecure. NOTE: Scatter is a good example of a 3rd party wallet out there. They have established them-self as one of the trusted wallet solution through out the EOS community. Interestingly they already have an existing API for you to integrate with your applications. Ok we are done with all the front end code. If you have reached to this point, give yourself a big pat on the back for following through. I believe we have completed a bare minimum front end for any EOS smart contract. All the work you will be doing in the future will most probably be built upon this base. I have posted this project files on GitHub: https://github.com/shankqr/eos-login . Now will be a good time for you to compare your code and mine to make sure everything is the same before we continue. Enter your account name along with the private key that you have created previously on the Testnet. Click on Login. If you have entered everything properly you will be directed to our Home page after a few seconds. Congratulations! you have just built your first Dapp. 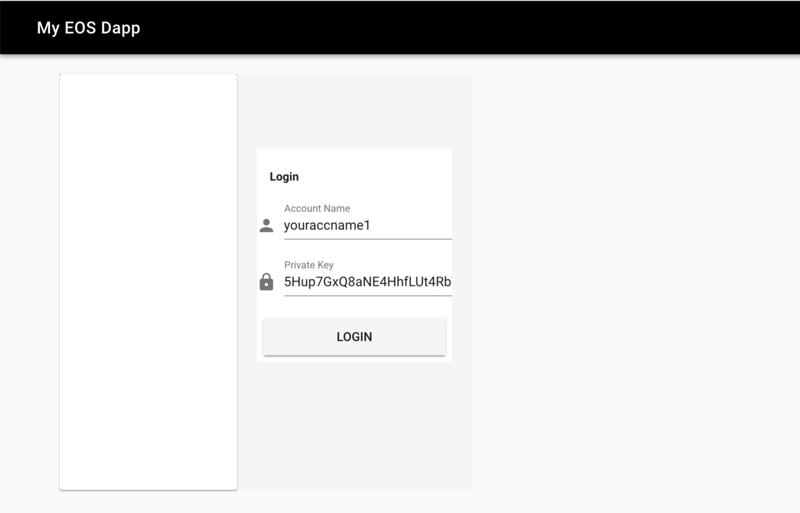 Before we end this series, let us just check to see if our smart contract have registered this login into our users table. Fantastic! Our smart contract is doing what it was programmed to do. Don’t you just love the Blockchain, it is just so reliable. I hope you enjoyed this guide, please leave your comments bellow. I am thinking about writing on Scatter wallet integration next. I would love to hear your thoughts. How to build a simple Front End for your EOS smart contract was originally published in Hacker Noon on Medium, where people are continuing the conversation by highlighting and responding to this story.